In the context of the Marie Curie project UrbaNetworks that focuses on the study of the urban growth of late Hellenistic Delos, an underwater survey of the submerged areas of Delos was conducted. The Cyclades has seen a sea-level rise of about 2 m over the last 2,000 years, engulfing many areas of the heavily urbanised Delos. This part of UrbaNetworks was a cooperation of the Institute of Historical Research of the National Hellenic Research Foundation and the Ephorate of Underwater Antiquities of the Hellenic Ministry of Culture and Sports. The project was first funded by UrbaNetworks (2014) and subsequently funded by the University of Birmingham (School of History and Cultures) (2015-16) and the Society for the Promotion of Roman Studies (Donald Atkinson Fund) in London (2015). 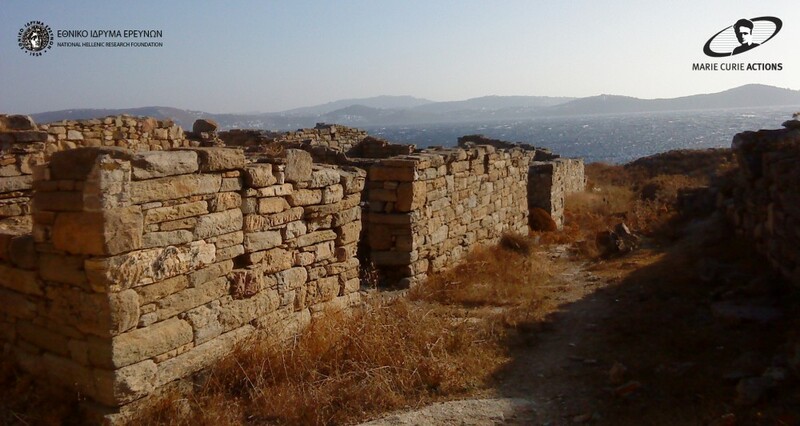 The 2014 and 2015 fieldwork seasons examined the remains of the submerged area of the Stadion District, one of the neighbourhoods that were created at the height of Delos’ urbanization period on the northeast area of the island, which is partly submerged by the sea. The aim of the two seasons (2014-15) was to re-identify and map the submerged remains in the Stadion District. In the past these remains had been identified as port facilities. However during the underwater investigation, it was found out that they are in fact settlement remains that form the eastward limit of the Stadion District towards the sea. The evidence for shops and workshops found in these remains indicate that a second commercial harbour operated in this area, and complemented the activities of the central harbour of Delos in the west part of the island. See here the press release of the Hellenic Ministry of Culture, Education and Religious Affairs for the 2014 fieldwork season. See also the related post of Current World Archaeology. For the 2015 fieldwork season, see here the press release of the Hellenic Ministry of Culture, Education and Religious Affairs and here for the press release of the National Hellenic Research Foundation. See also the related posts of the Archaeology & Arts Wiki and the Archaeology News Network. The 2016 fieldwork season focused on another one of the new neighbourhoods that developed in the late Hellenistic period on the northwest area of the island—the Skardana District. During the fieldwork season remains of structures (walls, marble columns and granite pillars) were found along the shoreline and in the bay of Skardana, from a depth of 20 cm down to 5 m. Specifically, a substantial foundation was located and mapped—part of a rectangular-shaped harbour infrastructure—, remains of smaller-scale structures, as well as parts of marble columns and granite pillars dispersed around the structure. The discovery of a shipwreck of the late Hellenistic period at a distance of about 35 m from the rectangular structure strengthens the proposition that the structure served as an anchorage boat dock. The rectangular structure seems to have reinforced the north side of the bay of Skardana so as to provide a safe anchorage at the north side of the bay, which was more protected from the north winds. It seems that—similar to the harbour of the Stadion District, which had been investigated during fieldwork seasons 2014 and 2015—an additional commercial harbour operated in the bay of the Skardana District, complementing the activities of the central harbour. During the 2016 fieldwork season, the research team conducted preliminary deep-water underwater surveys to the north of the bay of Skardana, to the south of the bay of Fourni, in the strait between Delos and Rheneia, as well as along the east coast of Rheneia, during which seven ancient shipwrecks were located—six of the late Hellenistic period, with cargoes of Lamboglia 2, Koan, Chian, Knidian and Brindisian amphorae, and one of the Roman period, with a 3rd c. CE cargo, probably from the Black Sea. Delos underwent rapid economic development after 167 BCE, when the Romans granted the port of Delos “duty-free” status under Athenian dominion and turned it into a commercial base connecting the eastern and western Mediterranean. Additionally, the strait between Delos and Rheneia was one of the major routes in the Aegean. Though the discovery of late Hellenistic shipwrecks is not surprising, the shipwreck of the Roman period points to the continuation of trading activity at Delos—and corroborates recent research on the Roman phase of the island. See here the press release of the Hellenic Ministry of Culture and Sports for the 2016 fieldwork season. See also the related posts of the Archaeology & Arts Wiki and the Archaeology News Network. After the conclusion of the 3-year underwater survey around Delos, a new 5-year project has been instituted in collaboration with the French School in Athens. The aim of the new 5-year project is to continue the underwater survey around Delos conduct a shipwreck survey around Delos and Rheneia as well as a geological investigation around the two islands. The collaborating institutions in this new phase of the underwater investigation of Delos and Rheneia will be the Ephorate of Underwater Antiquities, the French School in Athens, the National Hellenic Research Foundation and the Hellenic Centre for Marine Research.